In December 2018 Capital One sent shockwaves when it announced that it is joining the likes of Amex, Chase, and Citi, by introducing the ability to transfer Capital One points to airline programs. Initially Capital One announced 12 airline partners, and the following week added a further two. The final list of Capital One travel transfer partners was incredible, and raised the bar with a list that included some of the biggest names in the airline industry. So here is our complete guide to the Capital One airline transfer partners. In terms of earning rates and bonus categories, Capital One cards are middle of the road earners compared to other similar class of cards on the market. Capital One cards earn between 1.25 and 2 miles per dollar on most spending. One amazing earning option with the Capital One® VentureOne® Rewards Credit Card is on spending at Hotels.com. Here, you can earn 10x miles per dollar spent. One thing to remember is that this perk will be coming to an end effective January 31st, 2020. Capital One does not have high earning bonus categories like a lot of other card issuers. While this is unusual, it kind of makes sense since they don’t offer any premium cards. The most expensive Capital One cards carry a $95 annual fee waived for the first year. Cards from other issuers that have high earning categories tend to be premium cards costing several hundred dollars per year in fees. 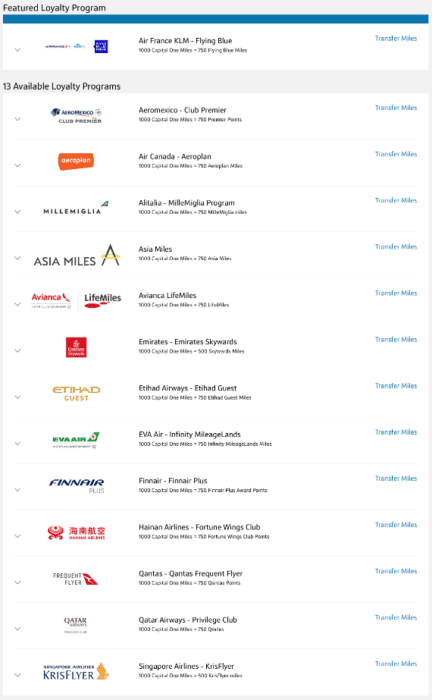 Capital One airline transfer partners have 14 airlines available. While there are no major US airlines that you can transfer your points to, the list does include a number of the biggest players in the business. You can transfer Capital One points to airlines like Singapore, Cathay Pacific, and Emirates amongst others. Transfer ratios vary by airline, although most transfers occur at a ratio of 2:1.5. 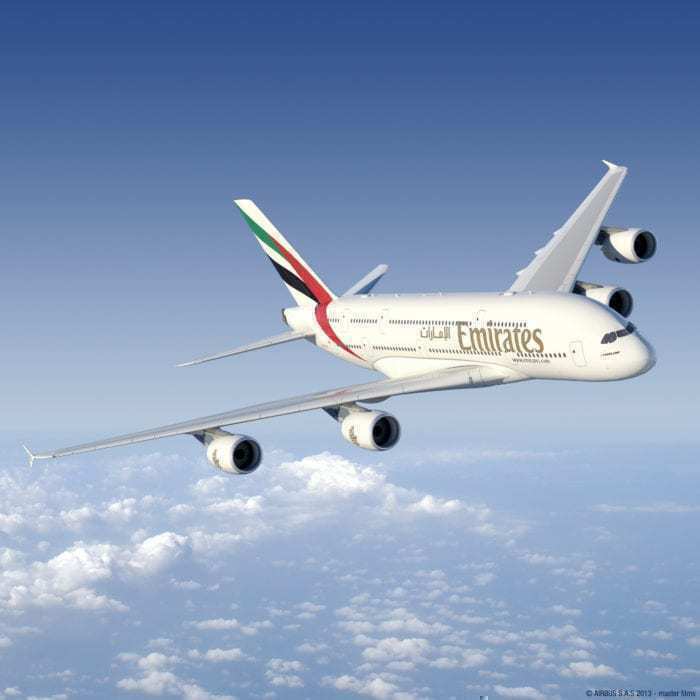 Transfer times vary between the different airlines. While other card issuers have many partners with which you can transfer points to instantaneously this is not the case with Capital One transfer partners. Some transfers happen the same day, while others can take up to five days to show in your account. Capital One transfer partners do not include any hotels, which comes as no great surprise since transfers from credit card points to hotel programs are generally poor value. Bear in mind that Amex and Chase have three partners each, while Citi also has no hotel partners. Only time will tell whether Capital One will add hotel partners or not. So far Capital One has not said whether it will offer any transfer bonuses or not. This will come as no surprise since the program is only three months old, and Capital One are probably still evaluating its success. We expect the question of transfer bonuses to be answered in the coming year. The process to transfer Capital One points is relatively straightforward. The first thing to do is to log into your Capital One account. You will then be taken to the Capital One transfer partners page, which will list all the airlines you can transfer your miles to. Select the airline you wish to transfer your miles to by clicking the “Transfer Miles” button on the right-hand side. 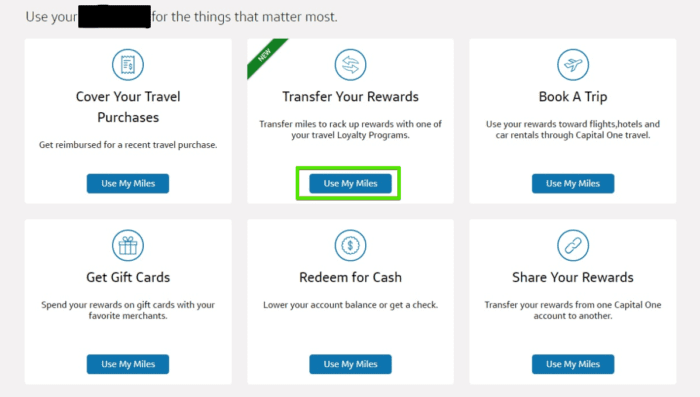 Once selected, an applet will open prompting you to enter the number of miles you would like to transfer. 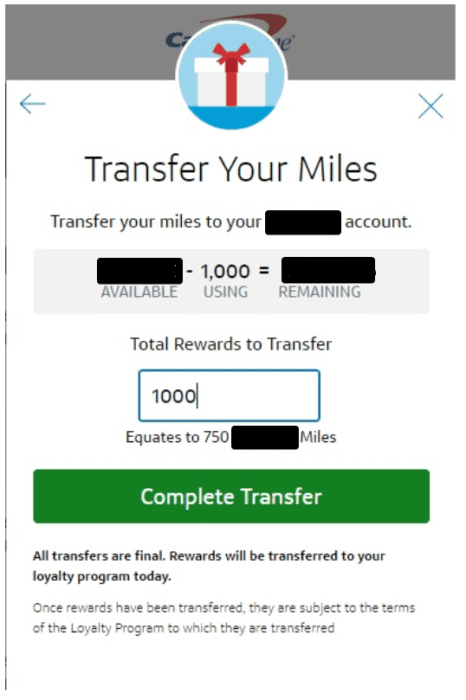 The applet will show information including your current Capital One mileage balance, how many miles you will have left after transferring, and how many miles you will receive in your desired program. Once you have entered your desired transfer, hit the “Complete Transfer” button and you are done. Having another flexible points currency that you can transfer to airline programs is a huge boost for points and miles aficionados. What’s more, Capital One hit the ground running with 14 great airline partners. Hopefully over the next few years, the list of Capital One airline transfer partners will continue to grow. One thing we have not seen so far is any transfer bonuses, which is no surprise since the program only started in December 2018. Over the next few months, we’ll find out whether Capital One will adopt the Chase approach and not offer any ad-hoc bonus, or will it go down the Amex and Citi route and offer the occasional transfer bonus. We hope it is the latter.